The Department of Chemistry began with the establishment of the university in 1967 as an institute of international standard for postgraduate studies in chemical sciences. Currently, the department offers PhD, MPhil, MSc, and BS degree programs. The department has four specializations, namely Physical Chemistry, Organic Chemistry and Inorganic/Analytical Chemistry with state of the art research laboratories and facilities for various areas of chemistry, including electrochemistry, materials chemistry, colloids and surfactants, polymer chemistry, coordination chemistry, environmental chemistry, computational chemistry, medicinal chemistry, organometallics, organic synthesis, chemistry of natural products, computer aided drug designing, inorganic materials chemistry, analytical chemistry etc. Due to strong academic and research program, our graduates are absorbed in different educational and R&D organizations of the country, while a good number of our students get scholarships for PhD/Postdoc from top ranking world universities. The department of chemistry is one of the strongest in terms number and quality of the faculty with many of them are foreign qualified. The department has won many grants from various national organizations, such as HEC, PSF, PAS, and foreign funding agencies including AvH Germany, DAAD, TWAS, etc. The US News and World Report â€“ Global University ranking 2019 has ranked the Department of Chemistry as # 367 in World subject (chemistry) ranking. 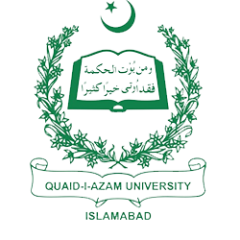 Quaid-i-Azam University â€“ previously known as Islamabad University - was established in 1967 by the Govt. of Pakistan in the newly built capital city for teaching and research programs leading to MPhil and Ph.D. degrees. Now, however, the university offers PhD, MPhil, MSc, BS, and BSc (affiliated institutes) degree programs in Natural Sciences, Biological Sciences, Social Sciences, and Medical Sciences (affiliated institutes). The university campus covers a vast area of 1700 acres (6.9 kmÂ²) below the Margalla hills â€“ the foothills of great Himalayas - that make Islamabad one of the most beautiful capital cities of the world. Quaid-i-Azam University is known for its academic excellence and has been persistently rated as the top ranking university of Pakistan by the higher education commission of Pakistan and international ranking agencies, such as Time Higher Education (THE) (2018 ranking 401-500 World ranking and 79thAsian University ranking), US News and World Report â€“ Global University ranking (2019 ranking Top 500 World ranking and 76th in Asian university ranking). Department of Chemistry, Quaid-i-Azam University Islamabad, 45320, Pakistan.